We are surrounded by sounds, some pleasant, and quite a few that are not. In order for a product to be accepted by customers, manufacturers must pay close attention to its acoustic signature, both for branding purposes and to limit noise pollution. Engineers must also consider the noise regulations that govern their industry, prior to product release. Problems identified late in development cycle can lead to costly rework and a delayed product launch. 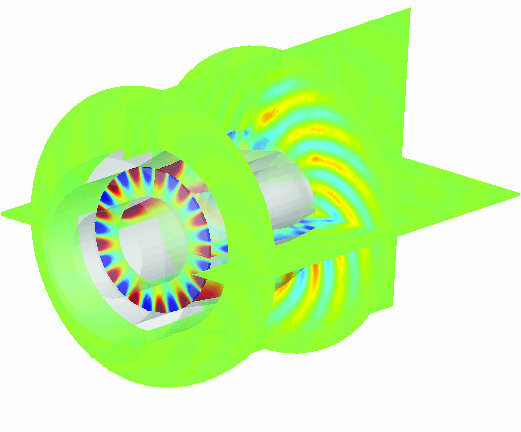 To improve the performance of the products, engineers need to understand the roles of noise sources and all the possible transmission paths. Because of the large domain of the model, it is critical to have efficient solvers and robust technology that can account for the interactions between structures and fluids. The finite and infinite element based technology from MSC Software is intuitive and easy to implement because of the familiar technology of FEA. It is also easier to couple with structural finite element analysis codes, helping you solve coupled interaction between structures and fluids. Aerospace: Sound transmission through cockpit and fuselage, engine nacelle liners, fuselage and cockpit insulation, ECS (environmental control systems), APU and ECS inlet and outlet silencers, trailing edges, sonars, helicopter turbine noise, random dynamic response of rocket payload at take-off, sonars. Automotive: Powertrain, trim design, wind noise, engine components, compressors, intake manifold, air filter, valve cover, baffling, electrical motors, loudspeakers, mufflers, tire noise, silencers, high pressure distribution ducts. Consumer Goods: Telephones, hands-free telecommunication, headsets, loudspeakers, hearing aids, musical instruments, washing machines, refrigerators, vacuum cleaners. Electronics: Disk drives, cell phones, cameras, LCD projector fans. Machinery: Turbomachinery, HVAC, lawn mowers and agricultural machines, exhaust systems. 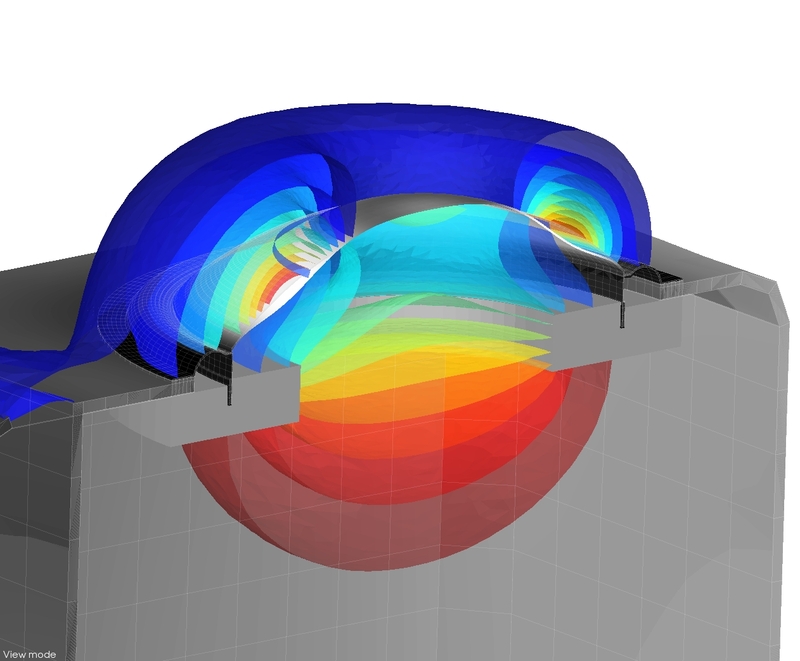 Analyze the radiation of sound in a fluid or in enclosed cavities to identify critical issues before prototype development. 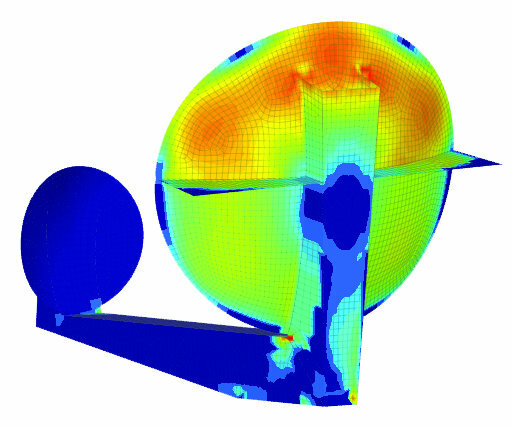 With the extensive acoustic analysis capabilities, you can extract acoustic modes, analyze sound radiation, model absorbing walls, study sound propagation in ducts, intake and exhaust lines, or distribution systems in building, aircrafts and automobiles. In order to study the interaction of structural vibration with the adjacent fluid, it is necessary to model the behavior of the involved structural components and the fluid as well. With MSC, you can analyze interior acoustic problems like cabin noise and exterior acoustic problems to analyze noise radiation to the environment. You can incorporate complex, realistic boundary conditions along with appropriate structural material properties of trim components for damping behavior. 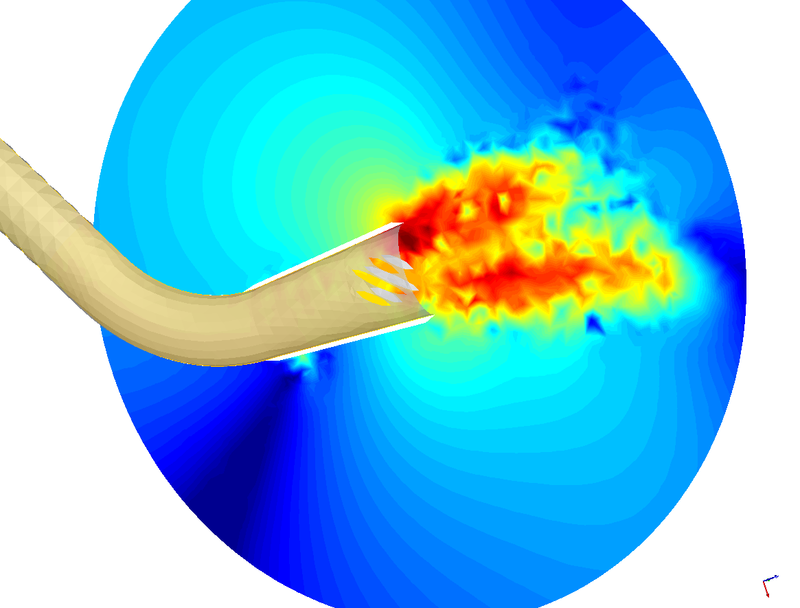 Aero-acoustics, is concerned with noise generated due to noise sources like turbulent flow within a fluid and its propagation within the fluid. 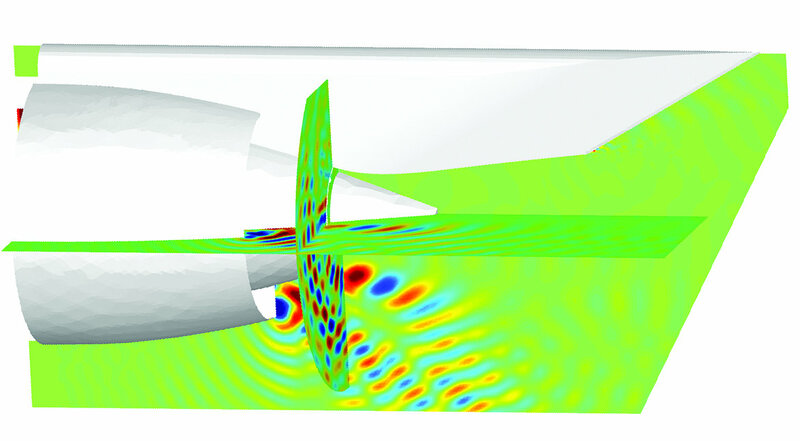 The aerodynamic noise sources from flow simulations performed with commonly used CFD codes are recovered, and used to compute the aero-acoustic noise. You can also combine this capability with vibro-acoustics giving you the ability to model complex aero-vibro-acoustic problems.